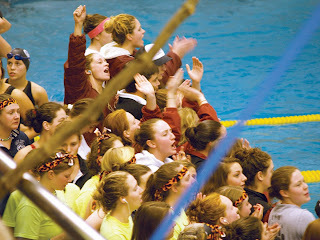 New Women's NESCAC Picts from Drake Daddy! Very cool shots. This is by far my favorite. 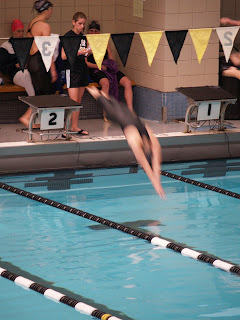 A Bowdoin swimmer flanked by Sarah Fallon. Her face is either one of complete determination, or utter disbelief. You decide! 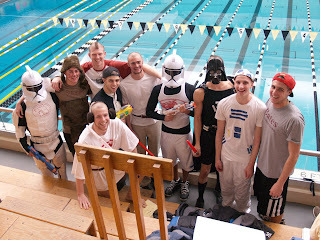 Shot of the boys supporting the women at NESCACs... "Swim Wars" was the theme! T-Bone...some food for next years pre-camp swim trip video. hahaa a little confident there drake daddy?! next years highlight will definitely top this one. its gonna be tough to keep it under 10 mins with all the new material coming up!